Last week over a breakfast meal of French toast, fresh cut fruit and grits the topic of assertiveness came up. It came up again at a recent nursing conference I spoke at in Cleveland. In simple terms, there are three kinds of behavior: passive, assertive and aggressive; Depending on the activity, we can do all three in the course of a day, though one style does tend to influence our personality and behavior. Example: people can have passive behavior with their dietary habits, yet have an aggressive behavior with their driving habits. With a passive behavior mindset, people tend to get walked over by others (who are being aggressive, or at the least, taking advantage of someone else’s perceived weaknesses). People who act aggressively toward others can do so in subtle ways including sarcasm, pessimism, peer pressure and the infamous passive-aggressive style. Aggressive behavior is motivated by anger (and sometimes fear). Passive behavior is motivated by fear as well, and usually both of these behavior styles are displayed unconsciously. The ideal way (a conscious choice) is the middle road, the assertive path, where you diplomatically achieve what is rightfully yours while ensuring that others receive what is rightfully theirs. To be assertive is to walk in balance. Honoring others as you would honor yourself. What is your predominant behavior style? Do you feel victimized? If so, you might be leaning toward the passive side. Are you often pissed-off, frustrated, angry, manipulative, passive-aggressive or easily peeved? If so, your dominant style might be that of the aggressive style. In striving to find the middle ground, practice using the skills of diplomacy when talking to others with regard to personal requests. Feel no remorse or regret with your choices. See yourself as worthy of what you want, but no better or worse than anyone else. Walking the assertive path is one of humble confidence. So, keep your chin up today, but lower your eyes to those less fortunate than you. Smile at those who come across as aggressive, for they have yet to make peace with their anger. Walk the middle path of inner peace. The following link offers some insights to the bill of rights for assertiveness. Take a look and try to adopt a few of these. And Melody Beattie’s classic book, Co-Dependent No More is the hallmark book of moving from passive to assertive behavior. 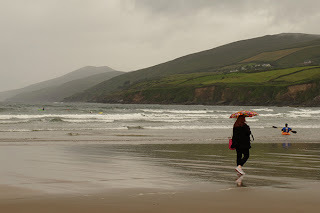 A photo of a tourist walking on Inch Beach near the Dingle Peninsula of Ireland. Enjoy! News headlines this week highlight a problem in the beef industry: Mad Cow Disease. If you have been following the news, there are other problems too. 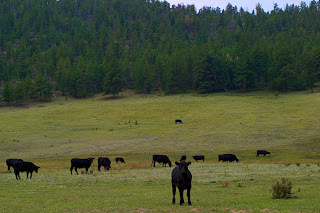 Last week my head turned 360 degrees when I saw a headline that read: “People eating cloned beef without knowing it.” News last week reported about the use of ammonia in cow remains that later become hamburger, also known as “pink slime.” It is safe to say that today’s hamburger is NOT your grandfather’s hamburger! By now we all know the stats regarding cancer and heart disease and the high saturated fat content of red meat. In case you didn’t hear, people who eat a lot of red meat are more prone for health related problems. Whether its Mad Cow, pink slime, E-coli, cloned meat, or abundant hormones and antibiotics, you don’t need to read between the lines here. There is a huge health problem eating beef. Simply stated, beef that contains chemicals and pathogens is a stress to the body. By an large, American eat way too much protein any way, so cutting back on these toxins is always a good idea. There is a good argument for being a vegetarian these days, when you consider all the preservatives, additives, hormones, antibiotics, petro-chemical fertilizers, ammonia and God knows what else in the meat you are eating. Today’s hamburger is NOT your Grandfather’s hamburger. If you do decide to continue eating mean, it is highly recommended to eat free-range food, animals that are not loaded with antibiotics and hormones and that eat natural grasses. Another bit of information worth sharing is that it takes over 2,500 gallons of water to produce one hamburger (water and the lack thereof is becoming a HUGE problem around the world. Here is the tip of the day: If you choose to eat red meat, consider eating buffalo (all buffalo is free range). Currently (and this may change) buffalo (domesticated) roam pretty wild, only eating native grasses. They aren’t shot up with hormones or antibiotics, like the factory farm cows, and there is typically less fat (making it a little drier, but it works well in chili. I highly recommend you read the book, Mad Cowboy, by Howard Lyman. He’s the former cattle rancher that Oprah had on her show. It was here she make the comment, after learning about the beef industry, that she would never eat another hamburger again… and then got sued by the beef industry. She won, thank God, but Lyman’s book is an excellent read. To this list I would also add the book Fast Food Nation by Eric Schlosser. These happy cows are grass fed (not corn fed). 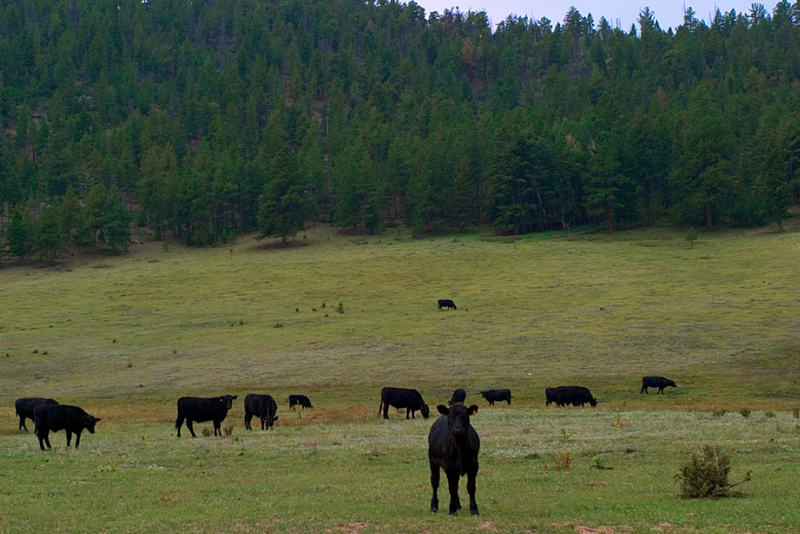 They are also high altitude cattle, living at about 8,000 feet above sea level near Estes Park. Enjoy! When I was teaching my course, Nutrition, Health & Performance at the University of Colorado in Boulder, toward the end of the semester, I would include a lecture about spiritual nutrition. After reading a passage from Autobiography of a Yogi about a woman in India who hadn’t eaten in 56 years, I explained the concept of energy through quantum physics and moved on the concept of entrainment, then introduced the concept of the 7 charkas, the colors (7) associated with each chakra, and finally foods that correspond to these colors and body regions. The root chakra is associated with the color red, and the region this chakra supplies energy to is the base of the spine and the organs in this region. “Ladies,” I would ask, “What are recommended to consume if you have a urinary track infection?” “Cranberries,”, they would respond. “Right,” I continued, “and what color are cranberries?” “Red.” “Excellent,” I would say. The take-home message of the Chakra diet is this: Eat a variety of fruits and veggies. In essence, eat a diet that includes all the colors of the rainbow. The chakra diet is also known as the rainbow diet, and it should be a part of everyone’s daily eating habits to promote optimal health. One semester, one of my students confided in me that he NEVER ate fruits and veggies. I cringed at the thought. Not only is fiber essential in the diet (as best as I could tell, he wasn’t getting any), the antioxidants and bioflavinoids, not to mention countless other goodies. Would you consider your diet spiritual in terms of rainbow colors? How many fruits do you consume a day? (fruit juices don’t count). Start thinking of food in terms of colors. Start thinking of food in terms of vibrations (color, after all, is a vibration). What’s for dinner tonight? 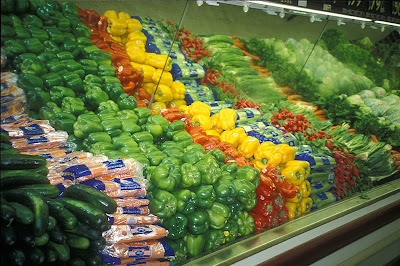 Be sure to include fruits and veggies in a stunning display of color. The news about planet earth today does not constitute cheery headlines. Our oceans are greatly depleted of fish (this week, Whole Foods Market has decided NOT to carry many species of fish that are deemed threatened including Tuna, Tilapia, and King Salmon). Ocean levels are rising and some low-lying ocean islands in the South Pacific are now threatened, as are her inhabitants. Many species are listed as endangered due to loss of habitat and many chemicals (e.g., PCB’s antibiotics, synthetic hormones, etc… the list is quite long) are now found in our drinking water with serious health consequences. Severe droughts are causing food shortages and energy demands (much of which comes from our desire to be plugged into our high tech gadgets) are exceeding the ability to safely extract fosil fuels, while sustainable means for energy are thought to be unprofitable. Meanwhile the world’s population continues to grow causing concern regarding limited resources. Stated simply, Mother Earth isn’t doing so well, and many of these problems are the result of humor error. Earth Day is a day designated to remind us to walk a sustainable path. May we do so quickly and remember that every day is Earth Day. Make it a point today to walk softly on the back of Mother Earth. Learn to be more conscious of your ecological footprint. You can begin with recycling, but perhaps more importantly, be even more conscious of what you buy. With each purchase, ask yourself, “What impact does this purchase have on the planet, and her people?” Live sustainably. Live consciously. Love your Mother! The following are video clips of my award-winning movie Earth Songs. Please scroll to the bottom of the page. Enjoy! 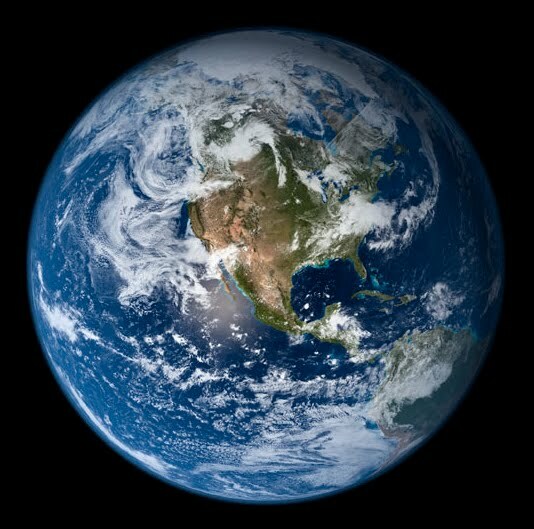 This photo of Planet Earth is a composite photo from several satellite images of our beautiful planet. During a conversation over lunch with a friend named Ian a few weeks ago, the focus shifted from global events and world problems to possible solutions and individual responsibility. Ian made the comment that the American way seems to fill every personal void with material possessions. The end result is quite unsustainable. I added that indeed, that the spiritual path cannot be measured in material possessions ,but lord knows we certainly try! 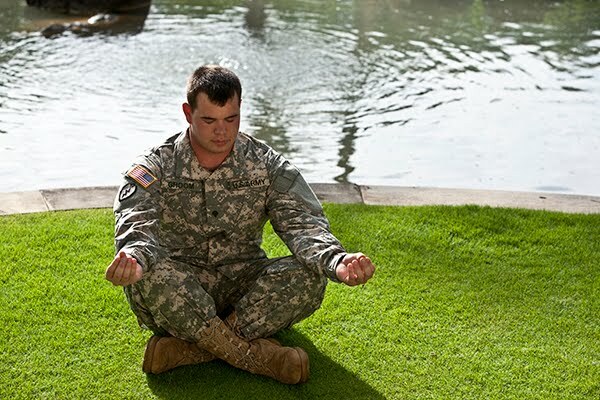 Having just finished teaching a stress management workshop in San Diego, the topic of unhealthy behaviors came up again among the workshop participants time and time again. It has become clear to a great many people that the personal habits of consumer materialism is not a sustainable path to take. Despite the fact that we know this, why is it that we keep doing it? One could argue that the perpetual act of gathering material possessions is an uncontrolled ego (times 7 billion people is REALLY unsustainable). Ageless wisdom reminds us that taking time to empty and cleanse is paramount to one’s spiritual health. Sages and mystics remind us that one must make a regular habit of “fasting the heart” to cleanse the soul. Only when we engage in a sense of personal balance will we walk the path of personal sustainability. Consider the act of fasting for the next several weeks; not with food, but with the purchase of material possessions, including clothes, entertainment, as well as large and small ticket items. Try to get by with what you have already. This sustainably! Be thankful for what you do have rather than longing for what you don’t. Learn to domesticate the ego in its unsustainable habits of consumerism. Become more conscious of what you actually need versus merely want or desire. “It’s not how much you need to get by, but rather how little you need to get by to enjoy life.” —Robin Lee Graham, author of the book, The Dove. It is said that the best things in life are free. 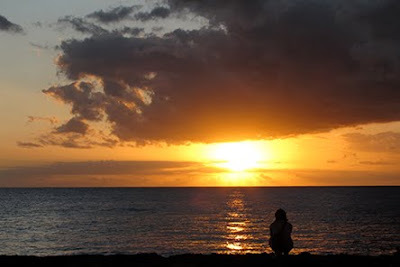 This photo depicts the joy of enjoying these moments that are merely carried in one’s heart, in this case, a beautiful sunset from the Hawaiian Island of Oahu. Enjoy! The other morning, while walking my dog, Logan, at the nature preserve near my house, I ran into a dear old friend named Harry. Harry is not his real name. Rather it is one he chose when he fled to the US from his home in Burma decades ago. Harry always greets me with a big smile and handshake, followed by a hearty laugh,“Good morning, kind sir” he says. Harry is the epitome of the Buddhist expression, Walk the path of peace. “Only when you live in truth, can your heart be at peace,” he reminds me often. I asked Harry what he thought of all the recent changes in his home country, including the election of the beloved Aung San Suu Kyi. He smiled from ear to ear. 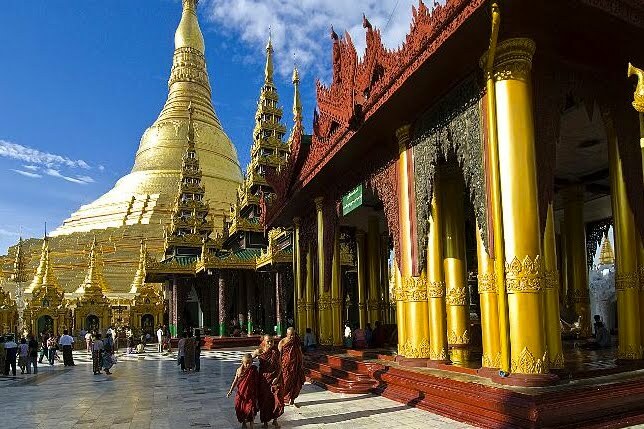 “Things are changing fast in Burma, he explained. “The democracy underway is like being a little bit pregnant. As a rebel fighter many decades ago, I fought for freedom against an oppressive regime, but I had to flee to save my life, so I came here to the land of the free. I have waited a long time for this in my country, but this is only a baby step. We shall see. Once you have the taste of freedom, you can never eat dirt again.” Harry ended his conversation this day by taking me to his car and showing me some photos of his hometown in Burma. I walked home with new sense of appreciation of the path of peace we strive to walk in our efforts for a better world. Today give thanks for your freedom, particularly the freedom to speak your mind without being arrested. Give thanks for living in a country where freedom is honored. The “path of peace” is a path of conscience, being conscious of your thoughts, words and actions in an effort to make this a better world, all of which is done with an open heart. No matter where you walk today, walk with a sense of conscience. Speak the truth (always with diplomacy). Be kind to your fellow neighbor (this includes all humans). Smile as you greet people, no matter who they are. Walk proud of your heritage, yet walk humble as a planetary citizen, doing good for all. This, Harry reminds me, is how you walk the path of peace. A new movie, The Lady, about the life of Aung San Suu Kyi will be released soon. It depicts the story of one of the most amazing triumphs of the human spirit and it is highly recommended. Harry asked me NOT to take his photo. He still feels rather sensitive about keeping a low profile in the land of the free. So in honor of his homeland of Burma, I downloaded an image off the Internet (with credit and thanks to the photographer). Enjoy! If you are like me, you might find yourself growing increasingly alarmed by various news sources regarding the quality of our food today. Currently, food labels contain more verbiage of what is not inside the package that what is actually in it. I taught a course on the topic of Nutrition at the University of Colorado for over a decade, and nearly every guest speaker I brought in spoke of the dangers of consuming too much sugar. If you are fan of the show, 60 Minutes, you might have seen their recent segment on the dangers of a high sugar intake. What I learned most from my guest speakers (and reinforced with 60 Minutes) was the influence of sugar on the immune system. Stated simply, sugar destroys the integrity of the immune system. When your immune system in compromised, then so is your health. Stress can also compromise your immune system. And, it’s no secret that when people are stressed, they tend to eat junk foods, processed foods and foods high in sugar content, which only adds more compromise to one’s health status. This is not to say that one should never have any sugar. What we teach in nutrition is this: Everything in moderation. How much sugar do you consume in a day? Research shows that the average person consumes their body weight in refined sugar each year. YIKES! That’s a lot of sugar! Rather than reach for something sweet with little or now nutritious value, opt instead for some fresh fruit (in season is the best). Sugar from fresh fruit is called fructose, and unlike refined table sugar, it contains vitamins and minerals making it a much better choice. The fiber helps too. Remember, a few sweets every now and then is OK, but keep things in moderation. Healthy boundaries with food are essential. The following are some links to the hazards of an over consumption of sugar, including the 60 Minutes segment. 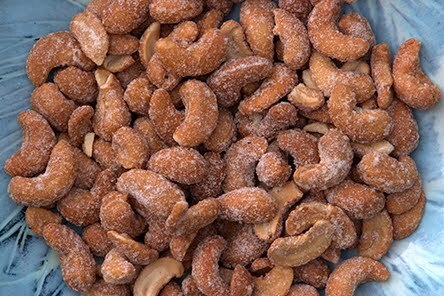 Honey roasted cashews (a photo I took for a slide show called The Low Stress Diet) may taste great, but only a few, even if they were bought at Whole Foods! Know your limits, and like everything else, practice healthy boundaries. Two of the hardest questions you can ever ask yourself are these: “Who am I?” and “Why am I here?” These are great questions to ask and we should revisit these questions with great frequency, as most likely the answers will change each time the questions are asked. These two questions, perhaps more than any others, are the hallmark of human spirituality. Your purpose in life is your destiny. It is revealed in the work you do, the friends you make, and the light that shines from your heart through your eyes. You know when you are fulfilling your destiny because things simply flow. Each of us has a meaningful purpose in life. What derails our efforts to fulfill our destiny? A great many things do, from laziness and apathy to scores of distractions (more commonly known as addictions). Sometimes roadblocks on life’s journey can reveal one’s purpose, as best described in this sage passage: A person often meets his destiny on the road he took to avoid it. Joseph Campbell described one’s destiny this way: “Follow your bliss.” Good advice! So today ask yourself this question: “How can you best follow your destiny? The world is waiting for your reply. How would you best describe your bliss? What makes you happy? Are you doing what makes you happy? If not, why not? How can you best fulfill your destiny? Try this: First, sit quietly and clear your head. Breathe. Take a deep breath and breath again. Keep clearing your head. When your mind stops racing, pose this question: how can I best fulfill my purpose in life, my destiny? Pause, breath and pause again. Then take a deep breath again. Let the answer come to you without forcing a response. It will come as a word or a short phrase, not a half hour soliloquy. It may even take a few tries to hear the answer without ego distortion. You’ll know when you get the answer… it will bring a smile to your face. Here is an essay/blog on finding your destiny… Enjoy! 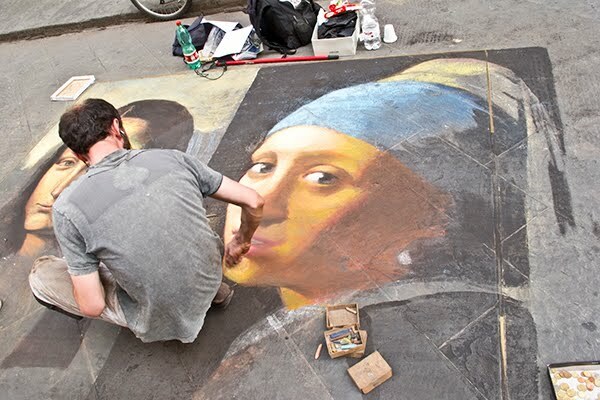 A sidewalk artist in Florence, Italy brings beauty to the eyes of tourists like myself. He was fulfilling his purpose, and definitely following his bliss. Enjoy! Here is an essay on finding your destiny… Enjoy! Last year’s group trip to Italy was simply “magical,” so much so, that I decided to plan a second trip back to the heart of Tuscany this year, with a side trip to Assisi (my patron saint is Saint Francis—just had to go there, even if it’s only for a long lunch) and our final three days are in Venice. If you have ever wanted to see these regions of Italy, traveling in the safety of a small group, with some dedicated time (about an hour) each morning for meditation, restorative yoga, music therapy and guided imagery, not to mention some fabulous meals and a gentle immersion into the Italian culture, history, art and ambiance, then please …join us! We have THE best tour company and guides that will make this trip a trip of a lifetime. This trip is open to anyone including couples. Italy is calling.. start packing your bags. The name of this 10 day-trip is: The Spirit of Italy: Eat, Walk, Meditate, and the trip’s theme is taking care of yourself. This trip will be a time to recalibrate your mind, body and spirit back to a healthy balance of living, with some life skills to take back home to integrate back into your life. Vacations can be stressful, but based on the comments from people who went last year, our trip was a flawless effort of relaxation and comfort. This year’s trip will be the same, perhaps even more so. We have 5 spots left and we have no doubt this trip will fill up soon. If you have any questions, please email or call me and I will be glad to answer them for you (303) 678.9962. One of the subtle underlying themes of this trip, based on the slow food movement, is to slow down to a comfortable pace of life… to enjoy life. Every street in Italy looks like it was filmed in a movie (and perhaps was). 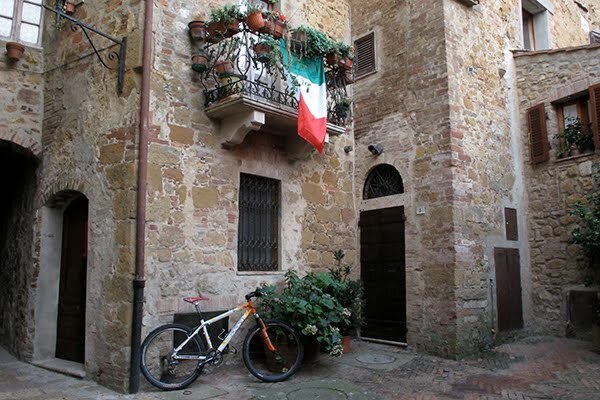 This photograph depicts the flavor of Pienza, a small walled city in which scenes from the 1968 movie, Romeo and Juliet were filmed. It’s no secret that music can stir the emotions. Music holds the power to either excite or calm the mind/body. As the expression goes, “Music soothes the savage breast.” Of all the means to relax, listening to music is thought to be one of the most common (with the advent of the Ipod, perhaps THE most common). Yet research in the field of music therapy reveals that not all music we relax to proves to be relaxing! First and foremost, the most relaxing type of music is that which is instrumental, be it jazz, classical, new age, etc. Music with lyrics draws in the analytical thoughts of the left- brain (the same thought processes involved with fight or flight) and this only keeps the stress response in gear. Of course the tempo of music is important, yet equally important is your perceptions of the music (whether you like it or not). You may think that you take in the sounds of music through your ears, but in truth you take in music through every cell in your body, via the properties of entrainment. Sound is energy made audible. Music is sound. Fill your ears with the most relaxing music today. Pull together a new playlist of relaxing music. Try to include selections from a host of genres including classical, jazz, and ambient new age compositions. Burn a few copies of this Music Rx, one for the car, one for the bedroom when you go to sleep at night, and one for the living room stereo. Rather than watching TV this week, pick a night and simply listen to nice relaxing music. Close your eyes and drift along as if the music is a river of energy that sweeps you away. Release any judgmental thoughts and allow the music to clear your mind of stress. 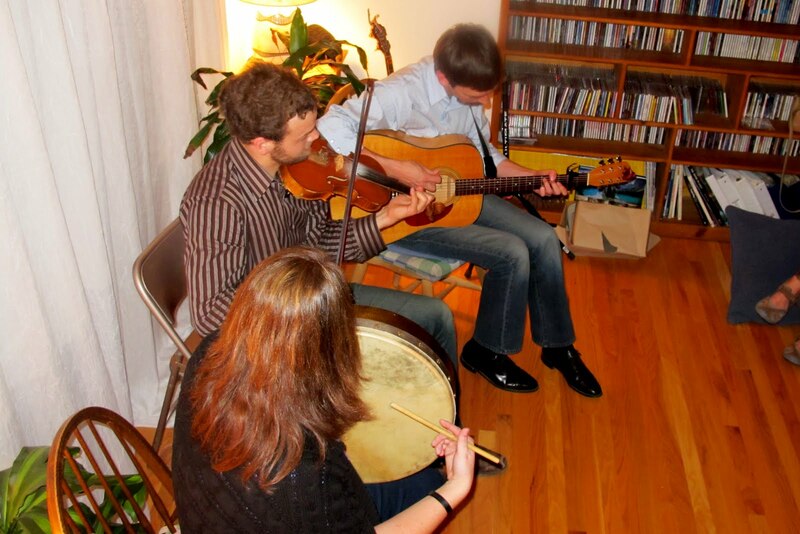 Every year, I host a potluck and Irish music house concert, usually around St. Patrick’s Day. This year’s party was one of the best, due in large part to the great music by Adam Agee, Jon Sousa and Emily Dawson pictured here (not to mention the great spread of delicious food!) Thanks to all who came to share a great meal, memories and tunes. See you next year!